You don't need to be a horror fan to know just how independent British film studio Hammer made their name. They'd been ticking along for some time with comedies and thrillers and big screen adaptations of radio and TV shows, doing particularly well with their feature version of Nigel Kneale's cult TV show The Quatermass Experiment, when in 1957 The Curse of Frankenstein caught the public imagination and became a huge international hit. It was this film and their dynamic take on Dracula that helped to brand Hammer as the house of cinematic horror. The Evil of Frankenstein was the second sequel to Curse in a series that ran for seven films, concluding in 1973 with Frankenstein and the Monster From Hell, and is regarded by many fans as a bit of an odd one out. Well it is and it isn't. 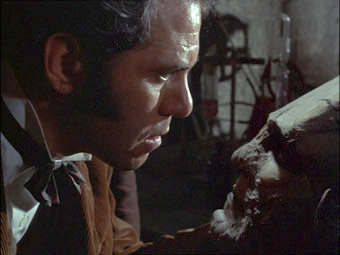 It's certainly not the best of the series – that honour is a shared prize between Curse, its immediate sequel Revenge of Frankenstein and the 1969 Frankenstein Must Be Destroyed – but neither is it the weakest, despite an overlong recap from the first film and a hurried and unsatisfactory ending. The plot certainly follows the series formula with the expected, episode-specific variations. 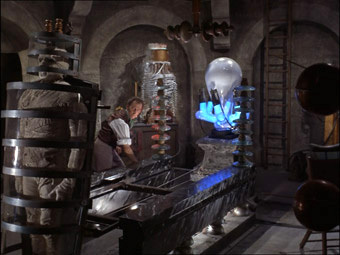 Baron Frankenstein and his young assistant Hans continue their experiments to reanimate dead tissue by extracting and reviving the heart from a freshly deceased body. The experiment comes to a premature end when the local priest turns up, blathers on about the immorality of their work and smashes the tank in which the heart is beating. Choosing not to wait for the mob we and they know will soon follow, Frankenstein and Hans hit the road and head back to the Baron's home town of Karlstaad, a risky decision given the anger his past exploits provoked there. A travelling fair makes it easier for them to move about unnoticed, but when Frankenstein publicly loses his rag after spotting his stolen possessions on the person of the local burgomaster, the pair are again forced to flee. A chance encounter with a deaf street girl leads them to a cave in which they discover the frozen body of the creature from the Baron's first experiment, offering him the unexpected chance to pick up where he left off. The Evil of Frankenstein has been accused of breaking the continuity and style of the series, but I can't help feeling this view is partly shaped by knowledge of the director switch from the revered Terence Fisher to Freddie Francis, who was promoted from the cinematographer's chair when Fisher was temporarily incapacitated in a car accident. 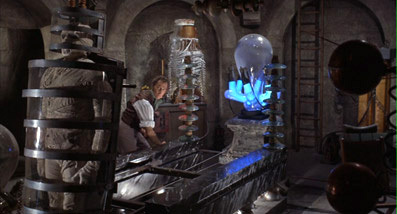 In terms of its lead characters it certainly fits into the chronology – it's safe to assume that assistant Hans is a slightly modified Dr. Hans Kleve from Revenge, while the ending provides an explanation for the injury that afflicts the Baron in the next installment, Frankenstein Created Woman. The first film is directly referenced via an extended flashback showing the creation of the original creature and the problems that resulted, but this is where the continuity does slip. The distinctive car-crash appearance of the creature from Curse has been transformed into a low budget approximation of Jack Pierce's iconic makeup for Boris Karloff in Universal's 1931 original. There's an irony to this that series fans will doubtless be aware of. When Hammer made Curse they were expressly forbidden by Universal to use the makeup or set designs from their heavily copyrighted original, but following the runaway success of both Curse of Frankenstein and Dracula, Universal did an about-face and struck a deal with Hammer to distribute their future output in the US. Presumably this agreement included the lifting of previous copyright restrictions on makeup and sets, and Hammer jumped at the chance to align their creature with what is probably the most iconic monster in horror film history. The trouble is they didn't do that good a job and the creature makeup here is about as convincing as the halloween costume worn by the monster in Tobe Hooper's The Funhouse. Despite treading often predictable and well worn ground, The Evil of Frankenstein will still be of interest to followers of the series and the Hammer style in general. It builds on established formular with the use of hypnotism to both revive and control the creature and in the hints of a mutually tender relationship developing between the creature and the street girl. The Baron himself is also – at least when not bellowing at the burgomaster across a crowded inn – at his most sympathetic and likeable here, a scientific progressive tormented by the ignorance and greed of others and doing nothing to warrant the damning dished out by the film's title. 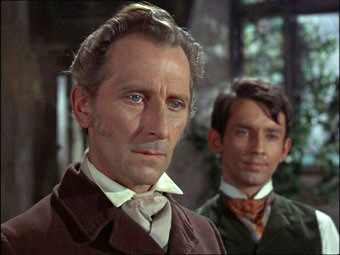 In his first and only Frankenstein film as director, Francis does a decent enough job, but with the creature reduced to almost a background character, the prime draw is once again Peter Cushing, whose determination, self-confidence and sheer physicality lends the movie a class that's sometimes absent elsewhere. It's a standout performance in an efficient but largely unmemorable and typically Hammer cast, though as hypnotist Professor Zoltán, Peter Woodthorpe comes enjoyably close to sinking his teeth into the scenery. Cushing aside, the most enjoyable moments of Evil of Frankenstein are almost throwaway in nature but invite deeper reading. During Zoltàn's stage show, for example, a hypnotised man is encouraged to emulate Frankenstein's creature, to the amusement of the crowd but the sadness of the disguised Baron, a sly acknowledgement of a common real-world mockery. It's also tempting to read a deliberate dig when Zoltàn sends the creature on a mission to procure riches from a church, the only place you're likely to find them in an otherwise poor district. A point of interest. When the film was first screened in US TV back in 1968, some of the more violent scenes were shortened or completely removed and replaced with new footage shot in the USA by a different director using actors who appear nowhere else in the film. The version on this DVD is, thankfully, the original cut. OK, let's get the framing issue out of the way first. The transfer on this new region 2 release from Showbox is framed 4:3 and yes, it's been cropped from a widescreen original. Over in the US you can buy this film as part of the eight-movie The Hammer Horror Collection, which was released by Universal in 2005 at a damned good price. In that set the film is presented in an anamorphically enhanced 1.85:1 transfer, which if the IMDb is to be believed – and on this score it sometimes is not – is the correct aspect ratio. I'm not so sure. A side-by-side comparison of the two discs suggests it is not and that 1.66:1 was the more likely aspect ratio, with the Universal release cropped at the top and bottom to suit. As you can see from the screen grabs above, the Universal transfer has more picture information at the sides than that on the Showbox disc, while the Showbox transfer has more at the top and bottom. It has to be said, though, that the Universal transfer rarely feels uncomfortably tight or cropped, while picture information is more obviously clipped by Showbox's 4:3 framing. That aside, the picture looks good, with contrast, colour and sharpness particularly impressive in places – when the Baron and Hans arrive at Karlstaad, for example – and though the dust spots are there, they print is for the most part a clean and damage free one. For the record, the Universal print looks every bit as good. The Dolby 2.0 mono track has an unsurprisingly limited dynamic range and some background fluff and crackle, but the dialogue is clear enough, save for the odd slightly muffled line. It's always fun to see how Hammer horror films were originally sold – I'm guessing from the voice-over this is the American trailer. The colour is weak but the picture is surprisingly free of dirt. Fans of Hammer horrors and especially the Frankenstein films are clearly going to be the main audience for this slightly below par entry into the series, whose UK DVD release has nonetheless been a long time coming. A pity, then, that the otherwise good looking picture has been cropped to 4:3, losing out to its better framed region 1 counterpart.